And other anti-gorge eel angling systems. 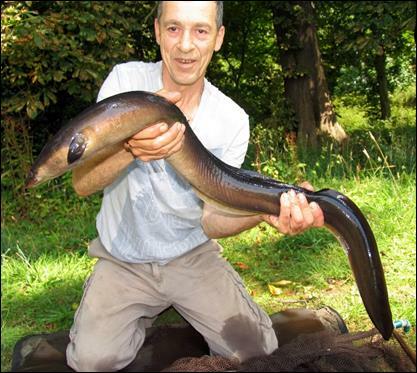 · The eel is in decline. · A deep hooked eel is likely to die. It has a major artery at the back of its throat, just over half an inch from the corner of its mouth. If this is severed the eel will bleed to death. · The Snig Twig is long enough and sufficiently rigid to deter the eel from mouthing it. · Thread two pieces of plastic tube onto the trace and then push the twig between them, fixing it to the trace. · Position the twig on the trace, up to half an inch away from the hook: any further away and the eel can get the baited hook (and line) into its mouth at the corner and from there it may reach the back of its throat. 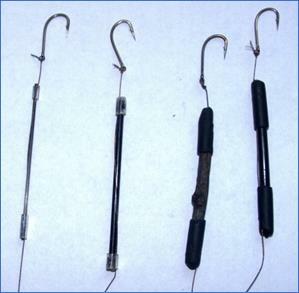 · The twig can be used with any rig and will make the rig safe to the eel. Simple! And effective! 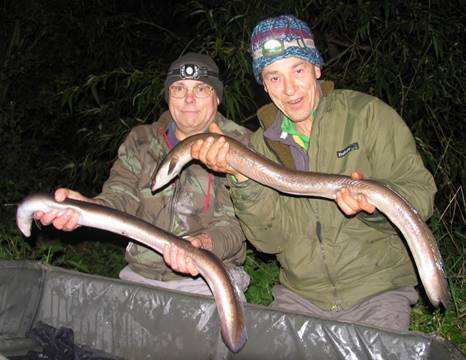 · Use of the twig needs popularising for the sake of eel conservation and to make eel angling friendlier in the current times when recreational eel angling with rod and line is under threat. · The snig twig has been field tested with bunches of worms for bait and found to be one hundred percent effective. · Only suitable for worms and small baits such as half a prawn or live or dead baits up to two and a half-inches-long. · Not suitable for use with big live or dead baits. Some things in eel angling have always bugged me, especially the two major hurdles of indicators and anti-gorge systems. When I looked at previous attempts to develop a resistance-free indicator arm, I realised that the job had never been finished and I felt a need to try and develop someone else’s work to see where it would end up. The resulting Rollover Indicator is a superb bit of kit that I now use all the time. And now, I have decided to look at anti-gorge systems. Ever since eel angling began there have been attempts at this. 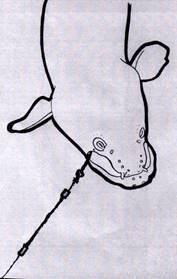 The first obvious adaptation is a matchstick pushed through the eye of the hook or swivel. Over the years this morphed into various different versions of a T-bar placed on the trace, butted up to the hook and then, as modern materials became available, some were curved into a C-shape by thinking eel anglers. Some of these were effective and quite a few eels were caught, successfully hooked in the jaw. But the work never got finished and seemed to fizzle out. There were never enough eels caught to fully develop the system and to show its worth to other anglers in order to help them gain belief and confidence. I realised that the system doesn’t just need adapting, it also needs popularising for the sake of The Eel and the future of eel angling. It is very frustrating when you deep-hook an eel, especially when it dies on you. 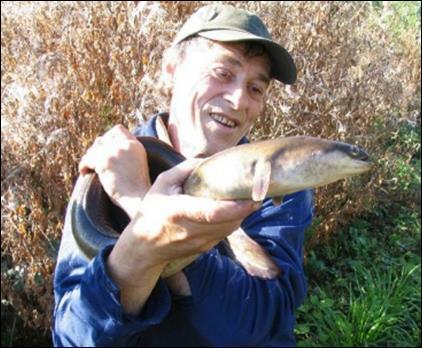 The eel’s main organs are at the back of its throat which is why eel anglers will cut the trace, leaving the hook in the eel, rather than poke about down the narrow throat with forceps or a disgorger, which is likely to damage a vital organ. Even worse is the fact that the eel has a main artery at the back of the throat and if a hook rips it, the eel will bleed to death. It happens! In the diagram T = Truncus Arteriosus. This is the main blood vessel leaving the heart. In years gone by I had tried crossbars, T-bars and a curved C-shape but was never happy with any of them. And then, as the years went by, my preference leant towards a round profile stopper because it has no protruding parts that could catch in silkweed, twigs and debris. 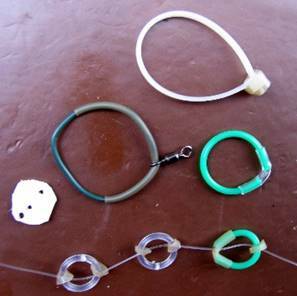 Many different models and different sizes were tried; crafted from hairgrips, cable ties, strimmer cord, plastic tubing, stainless steel wire, shirt buttons and plastic discs. Rather than butting the stopper up to the hook I decided to position it on the trace, one and a half to two inches away from the hook. Different models and sizes were tied. While doing intensive trials with round profile stoppers during October 2014, I caught forty eels. Most eels were hooked in the jaw, a few were inside the mouth but none had swallowed the hook right down. Although the stopper trials had been a success, I still felt the need to develop the system further. 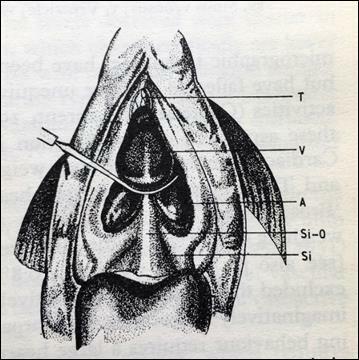 The way forward now was to simplify the set-up and also, because some eels were hooked inside the mouth, with the hook lodged near the back of the throat, the gap between hook and stopper would have to be shortened. The simple things are often the best – The hair-rig is just a simple hair. I do remember that everyone doubted it at first and lacked confidence in it before it was popularised. I have always leant towards simplifying my set-up and stripping off all the unnecessary gadgetry such as tubing, sheaths, booms, pop-up buoyancy-aids, oversized beads, etc. Less stuff on the line makes the set-up more robust, streamlined and aerodynamic for casting. There is less gadgetry that may twist, tangle or catch on ledges, rocks, weed or branches. Keep it simple. Strip down and simplify. With these thoughts in mind, in 2017, I decided to simplify the round-profile stopper set-up. 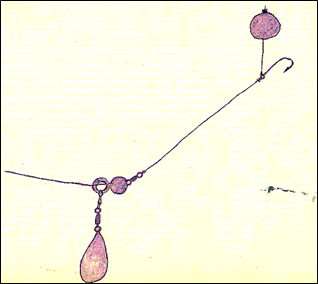 Instead of a shape, all that is needed is a single straight length to act as a gag. No cross-member, and neither T-shape, C-shape or round shape. Just a single straight line. Just a twig! Eels have been known to swallow lengths of flexible rig tubing, will they swallow a very thin, yet rigid rod? I also wondered if the length of rigid rod would put off shy fish and cause them to reject the bait? If you sit at home – fireside, pipe and slippers – and then think about using a wire trace, you can become convinced that metal wire will deter an eel and that you will catch more if you ditch the hard metal wire and use a soft mono or braid hooklength instead. But in practice, in actual real life, the hard metal wire doesn’t deter the eels. I know this because throughout my eel fishing career I have used wire and I have continued to catch plenty of eels. It’s the same scenario having a twig on the trace: think about it too much and you can put yourself off. My thoughts were that a twig should surely work. Proof was needed. I set aside the summer of 2017 to do trials. And so, the Snig Twig came to be. I started off catching eels with two large crimps on the trace. I called it a Scarecrimp but it was soon replaced with a piece of metal rod, covered along the entire length with rubber tubing, positioned on the trace a couple of inches from the hook. This then morphed into a lighter-weight plastic rig-tube capped at each end with sliding float bands that grip it into place on the trace. Then I used a hawthorn twig and caught a few eels before sourcing lighter and slimmer materials. Carbon fibre was next, first with a 2mm hollow tubing before finally settling for 1mm solid carbon rods that are very thin, slick and lightweight, while still being rigid enough to deter the eel from taking the twig into the mouth. Various different methods of attaching the twig were tried before settling for the two retaining bands which grip the twig into place on the trace. 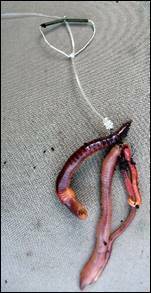 If you look at a bunch of worms on a hook lying on the bottom, the worms can be seen to loop their tail around and cling onto debris such as weed, leaves and twigs; they will also cling onto the Snig Twig. An eel feeding naturally on aquatic worms, snails and invertebrates is used to prising its food free. In nature, everything has a sucker, hook, claw or legs with which to cling onto weed, stones or bits of debris on the bottom. The eel will try to prise the worms away from the Snig Twig and as it does so, it will be backing up with the baited hook in its mouth. This is the time to strike. Eels are expert at stripping bait from the hook. I suppose it comes from their natural feeding habits where the eel will tug their food free and separate it from unwanted debris. They are skilful at pulling the worms, one by one, from the retaining hook to which they are attached. You get ‘funny little bites’ when eel fishing. Sometimes this is from smaller species pecking at the bait but often it is eels stripping bits of bait from the hook (or from the hair, for those that use one). Some eels will be finnicky and will toy with the bait; others will gobble the baited hook down straight away but although these eels are bolder they will not take a rigid, two-inch-long twig, with its nasty thin-spikey end, into their mouth. Confidence can be gained from other angler’s experiences, especially practiced anglers. 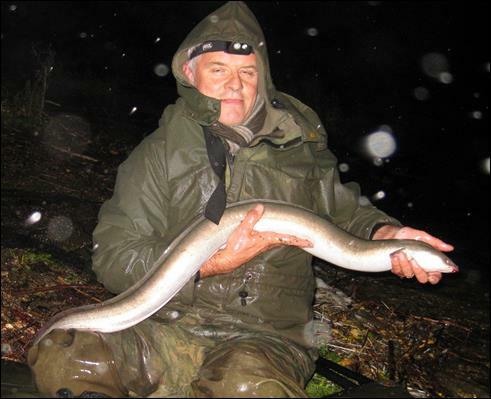 There are few eel anglers with more experience than Clive Dennison. It was with this in mind that, when I went fishing with Clive, I gave him a couple of twigs to use. I asked him, “If you were on a rock-hard water, targeting huge eels, and may only get one or two chances in a season, I bet you wouldn’t feel very happy experimenting with that twig on your line as it may deter the eel.” But Clive said he would be quite happy to use it in such circumstances. 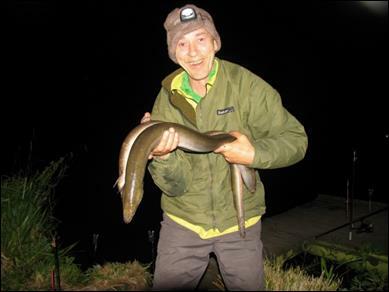 “If you believe it works for boots it will work for bigger eels – simple.” With this coming from the guy that ran the Eel Study Group, it gave me confidence and I went on to have a successful summer catching plenty of eels with a twig on the trace. Hopefully I can pass some of the belief on to you and give you the confidence to move forward and eradicate deep-hooked eels forever. It’s all about confidence. You get missed runs, dropped runs and bit bites all the time with ‘ordinary’ set-ups, with no twig on the trace; it’s part of the course of eel angling and so it will still occur when you have a twig on the trace (or not!). I do find that once you have confidence in the twig, it works! Clive used the twig to catch seven eels during the two-day session, all hooked in the lower jaw. I had calculated the distance from the tip of the eel’s nose to the back of the throat and matched the distance of the gap between hook and twig accordingly. The distance was reduced to half an inch after Clive pointed out that the eel doesn’t always take the bait in at the front of its mouth and the eel could potentially get the bait (and line) in at the side of its mouth occasionally, and this is a lot closer to the back of its throat. If you twizzle your wire trace on to the hook, then approximately a half inch length of trace just above the hook will have wire twisted around and the twig will be butted up to this. If you want to position the twig closer to the hook, you could tie the hook on instead (personally I always tie and have never twizzled) or obtain a thicker retaining band that will fit over the thicker length of twizzled trace just above the hook. Something else that got sorted out during this session was the need to use wire. I showed Clive my rig and said “I have always used wire trace for eels but with this rig I am using mono because all the eels so far have been hooked in the jaw so as they can’t rasp through the trace.” Clive pointed at the eye of my hook and said “Look!” And there was a whacking great big knot. He didn’t need to say anything else, I could see in my mind’s eye that the knot would be rasping on an eel’s toothed jawline if the hook was just inside its mouth. Point taken! I went back to the tried, tested and trusted wire trace for all subsequent trials. And this surely stopped a hefty eel weighing 4lbs 2ozs from rasping through the knot when it thrashed as I tried to pull it over the rim of the net. I could see the hook was just inside its mouth and the eye of the hook was pulled tight against its toothed jawline. Remember: it’s the extraordinarily big eels, that fish of a lifetime, that tests your tackle to the limit. Wire is the safest bet for big eel angling. There is no one-rig-fits-all scenario. Well that is as maybe but this is not a rig, it’s just a twig that slides onto the trace. It can be used with any rig. 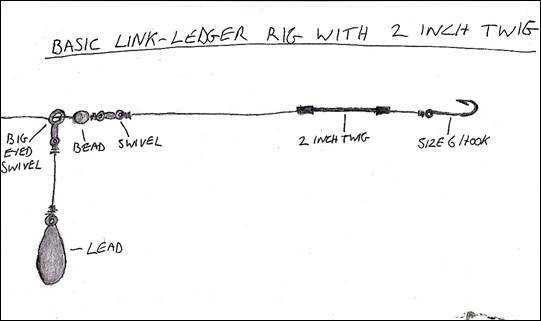 Both the basic link ledger and the JS rig can result in a high percentage of deep-hooked eels at some venues, especially when fished casually with the angler not right on top of the rods or when fished with too long a tail allowing an eel to back up a few inches and swallow the bait before it has registered a take at the indicator. Less, but still quite a few eels, caught using an off-bottom Dyson rig, manage to swallow the bait down too. None of this seems to matter so much if you have got a twig on your line. You can relax and use your favourite rig. I use mainly two rigs - the JS and the Dyson - and nowadays I have a twig on the trace with either rig, making it safe to the eel – and I am still catching! I prefer to use a barbed hook when baiting with worms because with a barbless, the worms are squirming off the crammed-full hook as I try to put a piece of elastic band on. The barb prevents this and keeps the worms in place. The barb is not so much of an eel conservation issue because the eel cannot or will not swallow the hook when there is a twig on the trace. A size 6 hook is preferred. I’ve used nothing but 6’s for years now and can assure you that they are adequate to land a big eel on. Short shank hooks are preferred. A longer hook, or a bigger hook, can penetrate further into the mouth towards the back of the throat and may snag the artery. The distance between hook and twig should be no more than half an inch, preferably a bit less, especially if small eels are likely to be encountered. The mono on the lead link of a link-ledger is not compatible with using wire as a trace material. This is because when the mono wraps around the wire it becomes trapped; thus, turning a free-running rig into a fixed rig. 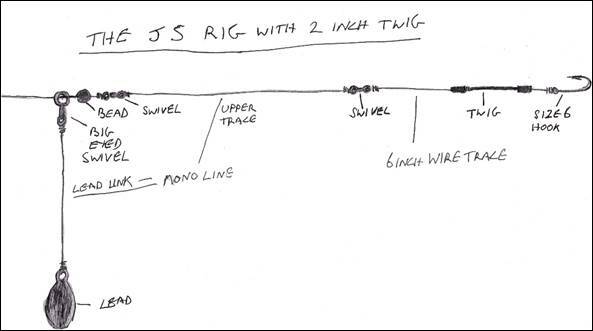 The JS rig with its upper mono trace was devised to overcome this incompatibility of wire and mono. Nowadays, things have moved on. Modern materials have aided tackle developments and we now have rig tubing and nylon covered wire. Some eel anglers will cover the mono link to the lead with tubing; others use a wire trace that is covered in nylon, and so they do not need to either cover the mono link with tubing or use mono for an upper JS trace. During 2017 trials using the twig, all the eels I caught were while using worm as bait except for one on lamb chop (New Zealand of course) and one on a perch tail section. The eel that took a perch section had a very wide-mouth and a bulbous, predatory-shaped head. The hook was inside its huge mouth as well as half the twig. As such the twig is not recommended for large deadbaits but it has been one hundred percent with worms. The big question is whether I would have caught more if I didn’t have a twig on the line. I did start the season off using two rods with the twig and two without but I deep-hooked five eels on the trot on the twig-free set-up at one particularly rich water, where the eels were wolfing the bait down on the spot. After that I used a twig on each rod and went on to catch a lot of eels. The season’s tally was eighty-one with ten weighing over 4lbs, which is a lot of eels, and plenty of good-sized eels too; proof enough for me to have full belief in the twig. Pete Drabble joined the twig trials for a couple of nights. He caught three eels on thumb-nail sized pieces of roach flesh. All the eels were hooked in the lower jaw. And one he caught on a two and a half-inch-long roach fry was hooked just inside of the scissors. At an NAC fish-in one weekend, Records Officer, Stephen Cotton was in the peg next door and he cadged one of my twigs off me. He wanted one for each rod but I only had one to spare so he put it on one of his four rods and duly caught a Personal Best eel weighing 7lbs 4ozs with the twig on his trace and worm for bait. Twig trials with worm as bait have been one hundred percent effective but that is just my results so far and, since few things are ever one hundred percent, it may be the case that an eel does eventually become deep hooked despite having a twig on the trace. If this happens, I will just have to think of the ninety-nine-point nine percent of eels I have prevented from swallowing the hook by having a twig on the trace; some of which the twig had surely saved their life. During field testing I allowed some eels to run and run, much further than I normally would, because I wanted to see if one would swallow the bait but each one was still hooked in the jaw. Two in the landing net at the same time during twig trials. I even caught two at the same time. I had one in the net. And then had to net another one on top, without the first one escaping. First a 3lbs 6ozs. And then a 4lbs 0ozs., both on the twig, one on a Dyson and the other on a JS rig. After the trials were completed, it was the 1mm carbon rod that was preferred for the twig. You can buy it online by the metre and cut to length but the postage costs more than the one metre length and it can be difficult to get hold of in such thin diameters. I bought in bulk and got free postage, therefore, I can sell it at a competitive price, already cut to size and supplied with attachment tubing in a handy strip of twelve from www.zandavan.co.uk. I went fishing with Alan Williams and gave him a strip of twigs. He was impressed, liked the way they were packed, caught two eels and encouraged me to sell them. With Alan Williams - An eel each. On the twig! Always keep a pair of scissors handy in the unhooking area. Most eels caught on the twig have been hooked in the jaw. Eels that are hooked in the jaw will usually snag the hook in the netting of the landing net. The hook snags the net and pulls free from the eel. The hook is now attached to the net but the wire trace is still going through the eel’s jaw. It is at this point that you need the scissors within instant reach. Handle the eel gently so as not to startle it because the eel is likely to spin its body and wrap the net around itself at any moment. One quick scissor-snip through the wire trace saves an awful mess of the trace, the net and the eel’s jaw. The Semi-bolt rig is good at reducing but not one hundred percent efficient in preventing deep-hooking. For live and dead baits, the hair-rigged cork ball rig is quite effective at preventing the eel from gorging the bait. 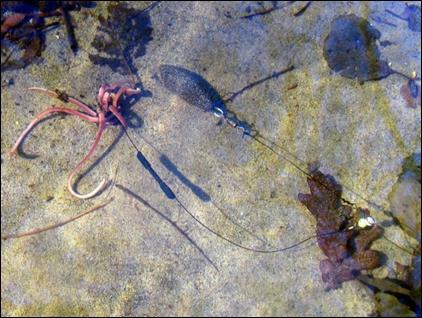 Nick Duffy has used it extensively on canals to keep his live bait popped up and found that he never deep-hooked an eel. It needs more thorough testing, especially with bigger baits. Circle hooks have been popular for sea fishing in America and Australia for many years and they are now catching on in the UK. A few anglers are happy using a circle hook and are currently developing their use to eradicate deep-hooking of eels. I tried them a few times but was never happy. I do like marmite though! They could be useful for bigger baits. Need more thorough testing. 8lb 1oz eel using a circle hook. Resistance rigs can be suitable for some venues but not others. 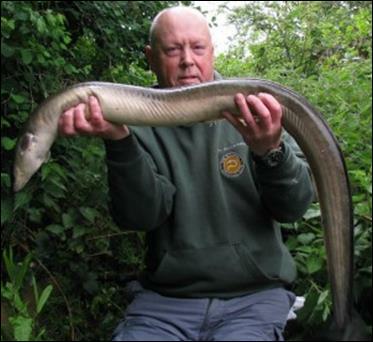 Some eel anglers have been successful with resistance rigs and caught some good eels. 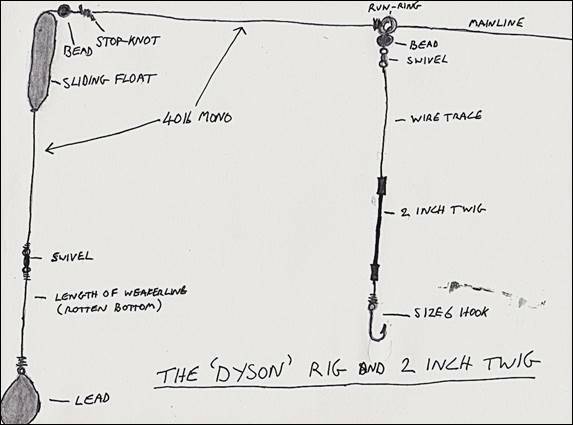 Personally, I don’t like the resistance rig concept and fishing off the tightened bait-runner, because when using this type of set-up, on some venues the runs go: Zz – zzzzz – zzz – zz – dropped it. I want to catch an eel; not put it off taking the bait. And I don’t want my soft worms pulled from the hook either. When you retrieve the rig, the hook should have worms on it and not come in bare, like it can when you try a resistance rig. They do work though and so could be worth investigating beyond my blinkered opinion. The deep-hooking of eels has been an ongoing problem to anglers for many years. Systems have now been suggested that can solve the problem, eradicate deep-hooking and save the life of many eels. Hopefully, anglers will find one of the systems (Twig, - Hair-rigged cork ball - Circle hook - Resistance rig) that they feel comfortable and confident to use; and so, eliminate this deep-hooking malpractice from the future of eel angling.